Craniosacral therapy can give benefits to everyone, whether they have excellent health and want to maintain, improve it or if they want less pain, more mobility. 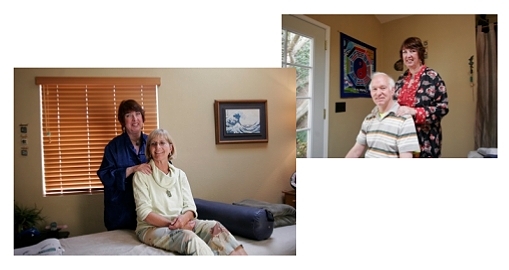 There are many situation that can be helped or resolved by Biodynamic Craniosacral therapy. The BENEFITS of Biodynamic Craniosacral Therapy and other modalities on this website can be experienced firsthand--if you are thinking of the resolution of pain or physical or emotional trauma, improving good existing Health, enhancing creative work and many other applications and would like to talk to me or make an appointment, give me a call or contact me on my contact page. If you are in San Diego area you can work with me in person, or we can do effective additional distance work. Everyone can benefit from Craniosacral Therapy, whether they would like to improve their existing Health, or need to create more ease and mobility, less pain or stress, recover from injury, trauma and/or balance the system. Craniosacral Therapy has been found to be effective for all ages and many unbalanced conditions including chronic pain, sensory processing disorders and memory loss. Craniosacral can also enhance the creative work of artists, writers, performers, and students' learning. Moms and babies, children, teens and adults benefit greatly from Craniosacral Therapy to restore the body to its best potential. Older people often find more energy and fluidity. In difficult times Craniosacral Therapy can foster deep relaxation and stress resolution, allowing the healthy as well as compromised system to move toward better potential and ease. I just feel so much better after easing up in a session. J.T. ------Young people often need support in their rapid growth and changes, physically and emotionally. Many circumstances for teens are overwhelming and difficult and support can be key in getting through and enjoying young years. In my work with young people as a teacher, especially in Theatre, I knew that they often felt as if they carried a huge weight on their shoulders, thinking that they could solve the problems of the world--it can be a wonderful and fearful time....and then there's always the burden and thrill of romance. School is demanding and extra activities-sports, the arts, all leave little time to just be, enjoy, and rest now and then. All these, along with social anxiety and shyness can be eased as the nervous systems are calmed with cranio work and help with self-regulation, and stress management skills. I don't feel as shy and scared with friends at school as I used to. N.M.
My work with Mrs. Behrends has helped me to calm down, focus, and change how I feel about high school. B.K. ------ Because this work can build health in the brain and the nervous systems, it can prevent and resolve chronic pain, including muscle aches, stiffness, neck and shoulder pain, migraine, fibromyalgia, and inflammation. ------PTSD and other anxiety and stress related problems respond well to cranial work, as does Autism, ADHD, and other Sensory Processing Disorders. ------Injuries and recovery from surgeries can be addressed, and even those that happened long ago can still have an impact on us and craniosacral work can help. ------ Many of us have current and past injuries from sports, falls, strain, auto accidents. "I can't believe how well I can move now." F.G. These create ongoing poor mobility, pain and anxiety that lasts way too long and can often be completely improved, as I know firsthand, having resolved a longtime ago fall resulting in being told I had a "permanent disability" that is no longer true. "After many years of stiffness, I can move more freely and am taking long walks again after working for several months with Craniosacral Therapy and other resources offered in my sessions." T.C. ------ Surgeries and outpatient procedures, including dental and cosmetic work can create continuing pain and anesthesia residue which may be cleared and balanced. "I have had the pleasure of receiving treatments from Victoria for several years, and it has helped me so much." V.E. ------ Resource building is key in craniosacral therapy as the system discovers its own blueprint of health and becomes centered and well, relaxed and empowered. I offer self-regulation, energy exercises, breath work and more as part of CST sessions, with a focus on positive changes and skills that the client can take with them. "I have learned to breathe in a way that allows me to focus and move away from stress on a daily basis. What a difference ! "M.L. "When I take my college exams I don't worry now and I can concentrate and remember what I have studied MUCH better than in the past, thank you so much for the help !" F.S. Actors, dancers, musicians, singers benefit from cranio work because that work impacts anxiety, stage fright and stress by keeping the nervous systems balanced-- fear of public speaking and test taking anxiety is alleviated for the same reason.